Hi how was your day? Good? What did you hunt? Was it big? Tasty? Are you a master hunter like me? I’m not as fast as I used to be, but I still have the moves. Come to Toronto Humane Society and show me your hunting skills. We can hunt together. Want to know about my day? My day was good. I slept lots and said hi to 100 people. They said hi back. I wish they would stay with me longer because I love getting to know people. Where do they come from? Where are they going? Do they live for the hunt too? I am looking for what is called a “foster parent” please! With this foster parent I can talk and cuddle and nap as much as I want. My foster parent won’t just say hi and go away like the others. They will stay with me — right? Come meet me and be my foster parent. Please. 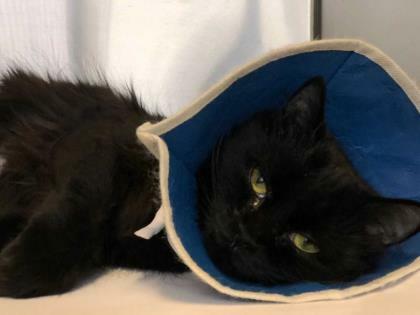 For more information about me and my health, visit the feline adoptions office at Toronto Humane Society or contact them at [email protected].